Affirm Press has sold out of its initial 6000-copy print run of Letters of Love, one of the publisher’s ‘profit-for-purpose’ titles, raising $20,000 for the Alannah and Madeline Foundation. 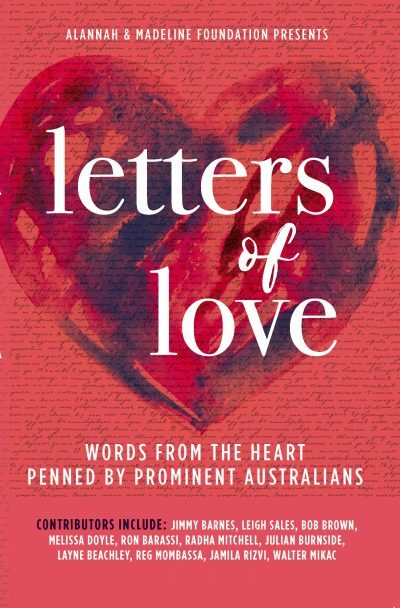 The book features letters from 50 prominent Australians, including Jimmy Barnes, Leigh Sales, Bob Brown and Melissa Doyle. The Alannah & Madeline Foundation’s mission is to protect children from violence and bullying, and was established in 1997 in memory of Alannah and Madeline Mikac, who were killed in the Port Arthur Massacre in 1996. Affirm Press publishing director Martin Hughes said the book ‘turns an ugly topic into something positive—opposing violence with a conversation on love rather than anger’. Affirm has ordered a second print run of 5000 copies, with a third print run under consideration. For more information, click here.